Asfar CIC is an NGO which aspires to make a difference in our society, through providing opportunities for the next generation of young people in the UK, the Middle East and the rest of the world through: educational, skills and development programmes, cultural exchanges and by supporting fellow NGOs, charities, educational and voluntary organisations to develop, ensuring their sustainability in an ever difficult sector. Asfar also aims to breakdown barriers in societies, end xenophobia through conflict resolution Sport for Peace programmes, while also preventing child marriage and promoting Women Economic Empowerment. The below aims represent Asfar’s foundation aims and objectives of 2012-2017. 2018-2022 strategic aims and objectives to appear here shortly. To support Middle Eastern communities to develop, especially those from disadvantaged backgrounds through our small grants. To provide advice, guidance, information and opportunities to new writers, thinkers and photographers. Asfar was established in January 2012 by Sheniz Tan to address the erosion of cultural studies at universities and HEIs, and to support the continued study of a wide range of subjects outside of the realms of economics, politics, and international studies. Asfar was also founded to support young people and young adults, especially those specialising in the region, to provide careers guidance, advice and opportunities, post-qualifications and university life. 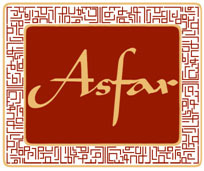 Asfar started life as a volunteer-based project and launched its first Middle Eastern-themed e-Journal in December 2012. Between 2012 and 2014, Asfar worked with over 50 volunteers, primarily young people, students and recent graduates with an interest in the Middle East. January 2012 – Asfar’s e-Journal concept is founded. April 2012 – Volunteers recruited as Editors and start working with Contributors. December 2012 – First e-Journal launched. January 2013 – Asfar receives funding from the British Council to deliver a Youth in Action programme entitled the Asfar University programme in Higher Education Institutes, universities and youth centres to promote Employability Skills, Citizenship, Inter-cultural awareness, Volunteering and Social Action. October 2013 – Launch of Development Consultancy services to fellow NGOs, charities, HEIs, training providers and Sport for Development organisations. April 2014 – Asfar finishes its delivery of the Asfar University programme. The projects supports over 32 young people, 10 of which moved into employment, education or training. All gain their EU Youthpass recognising their achievements. July 2014 – Asfar is recognised as an official Erasmus+ provider by the British Council and Ecorys UK and starts implementing 3 Middle Eastern-based Transnational programmes. January 2015 – Asfar’s international programmes go live. September 2015 – Transnational meetings starts for Asfar’s new strategic programmes. October 2015 – Asfar completes 2 Erasmus+ programmes in UK, Turkey and Jordan. January 2016 – Asfar launches 3 new Erasmus+ KA1 Youth Exchanges – focusing on conflict resolution; cultural engagement; skills development; women empowerment and including work in: Turkey; Macedonia; Serbia; Bulgaria; Georgia; Azerbaijan; Israel; Palestine; and Morocco. November 2016 – Asfar’s CEO contributes towards House of Lord’s International Relations Committee’s Round Table to understand the current situation of young people in the Middle East. January 2017 – launch of consultation of 2017-2020 Strategy. February-May 2017 – transnational research in Germany, Russia, Georgia and Azerbaijan with partners, participants and volunteers – new strategic aims and objectives identified. March 2017 – launch of a separate Women’s Volunteer Group’s to work on Women Economic Empowerment programmes. April 2017 – search begins for young Trustees for new Caucasus Sport for Peace charity. May 2017 – House of Lord’s launches the new policy: The Middle East: Time for New Realism now. June 2017 – Asfar confirms its to launch its first ever European Voluntary Service programme in Autumn 2017.